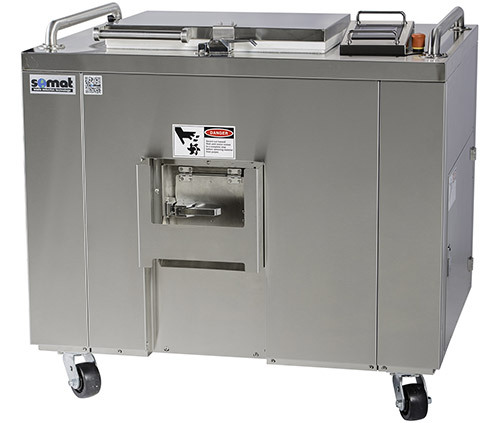 Somat’s DeHydrator System is a unique waste management system that can process waste for medium size foodservice operations to very large institutions or facilities with high daily load requirements. The DeHydrator System is easy to install, operate and maintain. It requires no venting or fresh water connections. Only one person is required to operate the DeHydrator and it requires very little maintenance. It’s ideal for those facilities striving for more sustainable operations, it has zero impact on the environment. How do Food Waste Dehydrators Work? Place compostable waste including food waste, compostable disposables and cardboard in the Dehydrator. Agitators will stir the waste. The unit’s decomposing chamber will heat the waste, kill any bacteria and reduce the waste matter by up to 93%. Temperatures up to 180° ensure the end product is odor free. Additional waste material can not be added during the cycle. The end product is a material ideal for use as soil amendment. It is dry, light and odor-free. Reduces waste volume by 9 to 1 (93%). Decomposes compostable waste without using any microorganisms, enzymes or additives. Capable of waste input capacity from 110 to 220 lbs. Low labor requirements, a one person operation. Requires no special installations, ventilation or fresh water hookups.